"I used to come home very late at night and watch TV to forget the daily specials before I'd work on any art. I'd scan the channels. There's really not much to see. Everything boiled down to the same low level of meaninglessness. Everything was a fragment of a total spectacle: the most horrific news next to the most glamorous gold ring next to the most glamorous celebrity next to cooking oil. News, events, fiction, data, scandals, starving children, etc., are all collapsed into a level of historical inaction—a dark landscape, sterile, meaninglessness . . ."
Amnesia is a condition marked by gaps, lacunae in the fabric of memory, missing pieces from a continuum. As a medical condition, amnesia afflicts individuals who cannot recall specific events and times. As a metaphorical condition, amnesia can afflict countries and societies with a collective forgetfulness. History is not the continuous, linear narrative of the past, but rather, a continually shifting collection of fragments held together by those pieces we prioritize and those we choose to forget, a kind of dark matter filling the space between what is desired or allowed to be visible at any given moment. These gaps, however, do not represent loss, but rather discontinuity. "I die once so I have only one life. Literally speaking, continuity means nothing and discontinuity means existence." -On Kawara in conversation with Lucy Lippard, 1974. Andrea Rosen Gallery is truly excited to present an exhibition of three remarkable projects, Felix Gonzalez-Torres' "Untitled" (It's Just a Matter of Time), 1992; a singular masterpiece, a set of 12 On Kawara date paintings from his Today series comprised of one canvas from each month of a single year, and an extensive and complex film and video program expressing a multivalent reading of amnesia curated by Rebecca Cleman and Josh Kline of Electronic Arts Intermix (EAI). While many artist's work can be said to describe the phenomenon of social amnesia, the three components of this exhibition were selected because they all seem to embody a deceptive sense of continuity—the billboards always have the same text, Kawara's canvases give the appearance of always looking identical, and film and video have a sense of being a stagnant record forever embedded in the medium—but at their root and as the projects are used in this exhibition, they all convey an overt sense of inherent discontinuity providing us an opportunity to experience the works intellectually and viscerally. 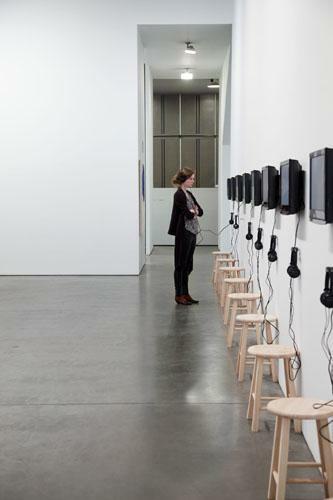 The video and film program curated by Rebecca Cleman and Josh Kline serves as a crucial link in the exhibition and foregrounds the underlying interest in media in both Gonzalez-Torres and Kawara's practice. Inherent to the physical properties of film and video is a material degradation and far from serving as an accurate record or recording, all videos and film, no matter how documentary, are ultimately subjective. Cleman and Kline have created a multifaceted program exploring several different themes and types of amnesia, with the content dynamically changing throughout the course of the exhibition. 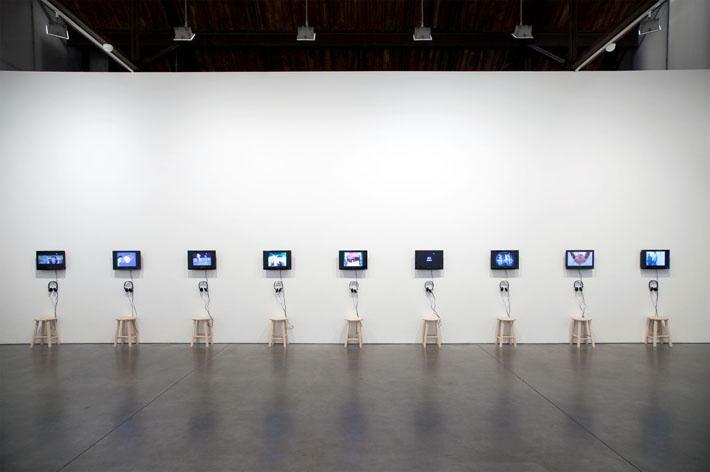 When one stands in front of the nine monitors, they become a manifestation of the collapsed, simultaneous experience Gonzalez-Torres describes in his quote about television. 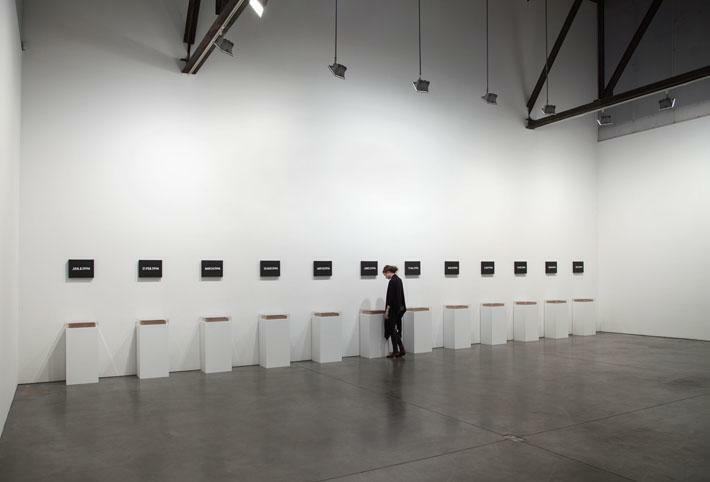 Both Kawara and Gonzalez-Torres' work is initially deceptive in seeming to be mostly about the passage of time and our existential relationship to it, however, both slowly reveal themselves to be equally if not more so about our shared historical condition of amnesia and how place alters content. 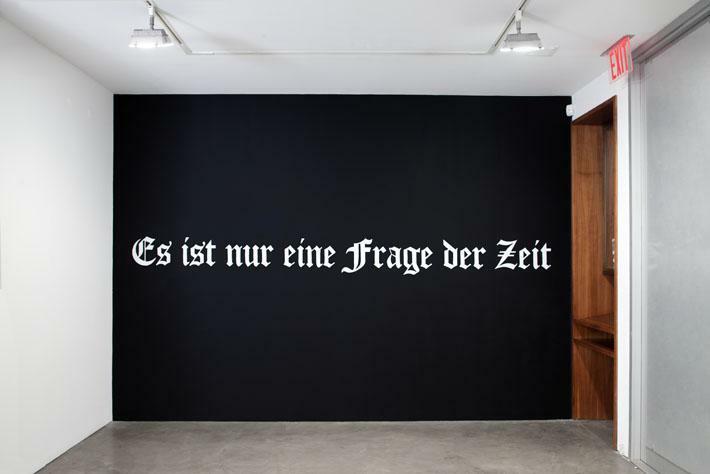 First exhibited at the Kunstverein Hamburg in the 1992 exhibition Gegendarstellung: Ethics and Aesthetics in the Age of AIDS, "Untitled" (It's Just a Matter of Time) features the text of the work's parenthetical title in the original German in white, Gothic font set against a black background. That the billboards continue to persist and be exhibited in new contexts and places makes the purposefully contradictory and multivalent meaning of the text more powerful. 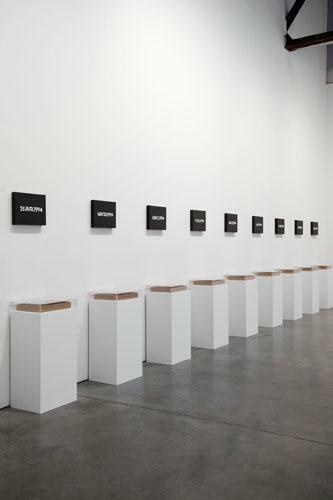 Kawara's works similarly become more and more expansive as time goes on. Each canvas represents the intense labor of a full day of painting and mark not only a moment in time and place, but become linked both backwards and forwards to Kawara's ever expanding, unparalleled lifelong project. 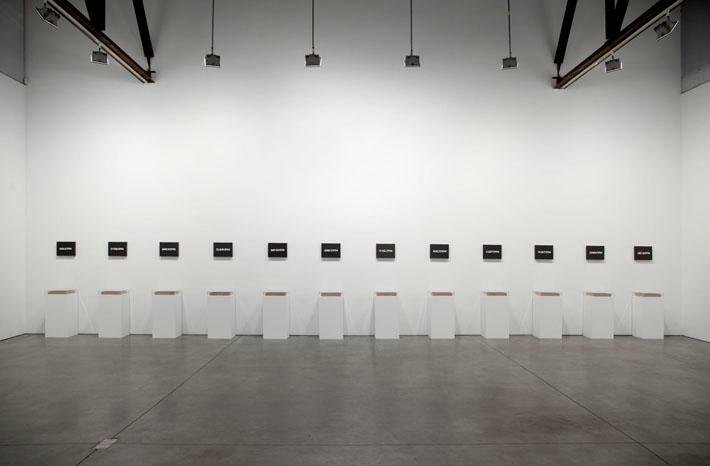 It is surprising when seeing all twelve Kawara canvases together, and against one's immediate assumption, one sees how the formatting of the painted dates subtly shifts based on the local standard where the works were produced. For this exhibition we have chosen to exhibit the handmade boxes lined with a newspaper clipping from the day the work was produced. Seen from a distance, it is possible to apprehend all of the canvases at once, but it is only possible to view the boxes up close, mimicking the public address of the canvases and the seemingly private nature of the boxes. As if capturing a random frame in one of the television screens, the newspaper clippings are merely one part representing a whole. 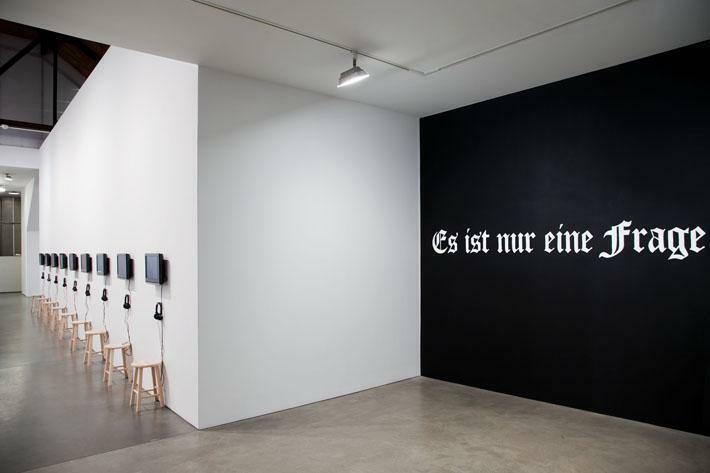 There is no formula for what is selected from the newspaper and Kawara's particular framing of that day's events point not only to what is being displayed, but the magnitude of what is unknown and forgotten. ". . . they're betting on amnesia. That's what they're counting on. They're counting on that you all forgot." If we are prone to amnesia, we can also be saved by it. Without forgetting, there is no remembering and without gaps, there is no need to construct histories to fill them. Gonzalez-Torres and Kawara both made works that affirmed their own existence and each artist's deep sense of responsibility to knowing his society make the seemingly mundane act of living miraculous and consequential. A billboard appears, a day is lived and remembered, a video is recorded and broadcast. It's only a matter of time. I am still alive. For additional information on the billboard project and the film and video program, please download the complete press release pdf above.